Pythagoras was a Greek mathematician and also spiritual leader and philosopher. He founded a religious group called Pythagoreans and a movement known as Pythagoreanism. This religious group worshiped the God Apollo. It is believed that he was the first person who referred to himself as a philosopher. His theories are still used in mathematics today. 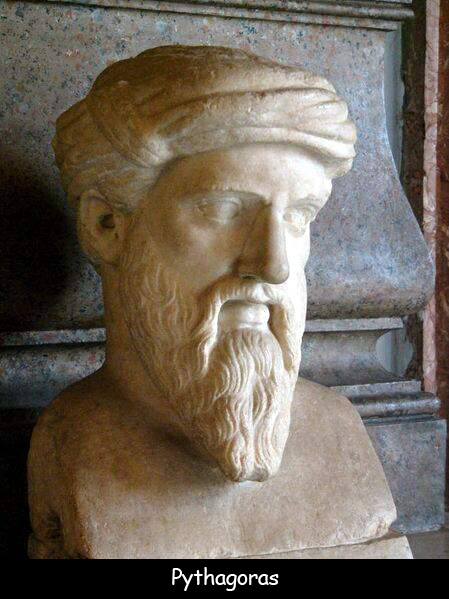 Pythagoras strongly believed that the Earth was round and that mathematics could explain the physical world. He also gave an idea that the stars and planets in the universe move according to mathematical equations. The Pythagorean Theorem is believed to have been used by the ancient Babylonians and the Indians. It is also believed that he made some important contributions in different fields including medicine, music, astronomy etc. He believed that there is some kind of connection between religion and mathematics. Pythagoras also had a great influence over other philosophers including Plato. Both of them had a similar approach. It is believed that he probably taught his pupils by speaking to them as no books or writing by him have been found. His followers believed that he had already lived four lives and he could remember all of them. Declan, Tobin. " Cool Facts for Kids about Pythagoras ." Easy Science for Kids, Apr 2019. Web. 23 Apr 2019. < https://easyscienceforkids.com/pythagoras-facts/ >.